Sunset off the west coast of Portugal, and on our second season of cruising. 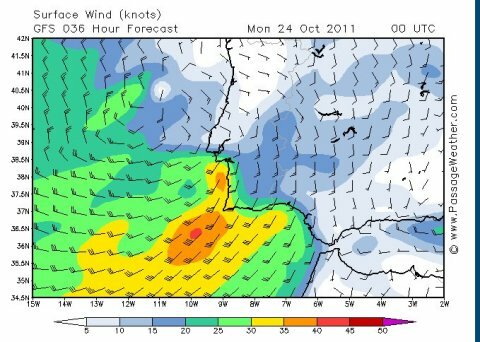 We left Cascais with an ideal forecast for the overnight passage to Lagos - northerly F4 winds, 1-2 metre seas, blue sky and sunshine. 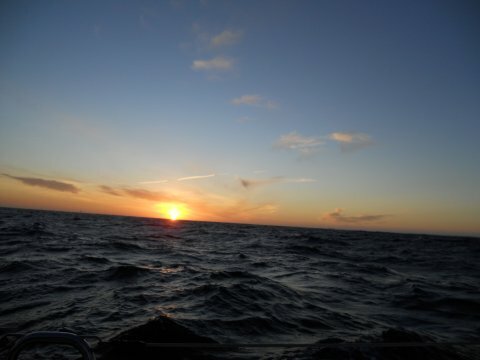 The forecast panned out fairly accurately but the sea state was, as we've so often found, rougher than expected, not necessarily in height but in frequency, which was quite high, so we spent most of the passage rolling, with the waves foaming and breaking at the crests. Quite uncomfortable and not very conducive to getting any sleep off watch! The motion also made going below to prepare hot drinks, dinner or to use the heads fairly hard going. We gybed several times as the now F6 wind was parallel to our rhumb line, but this added no more than an hour to our anticipated passage time as we were making good speed. 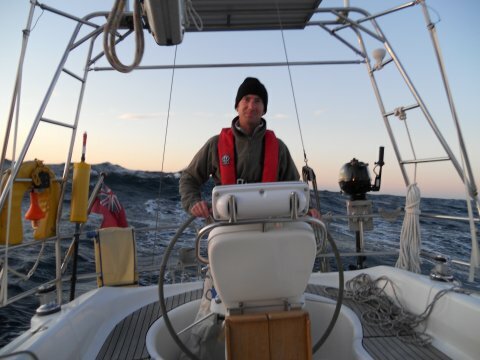 Although only one night compared with the two that it took us to cross Biscay, we had 12 hours of darkness. However it was much warmer than Biscay, Andy needing nothing more than a fleece all night (well not just a fleece) and a change to evening-wear titfer... Whilst trying to get some rest below, I was startled by Roca Control giving a DSC securite message every two hours about a survey vessel working off the west coast of Portugal. 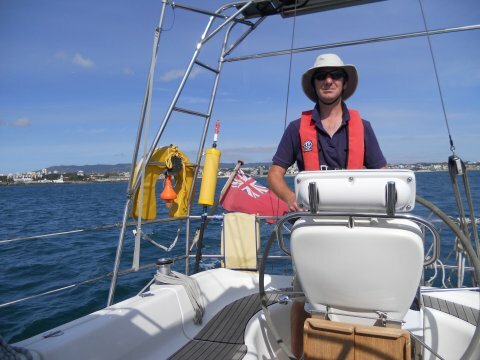 It was obviously towing equipment as the securite advised all vessels to keep 3NM clear ahead and 7NM clear astern. I noted the position, course and speed and plotted their position on the chart, as well as ours and checked that we'd be far enough away. 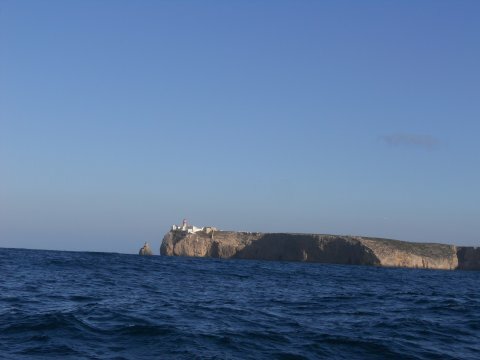 We spotted the lighthouse at Cape St Vincent well before dawn and could also see the one on Pont de Sagres beyond. As dawn broke, we neared Cape St Vincent and rounded just after 0900. The wind had been forecast to drop off to nearly nothing in the early hours, which didn't actually happen until some time later. 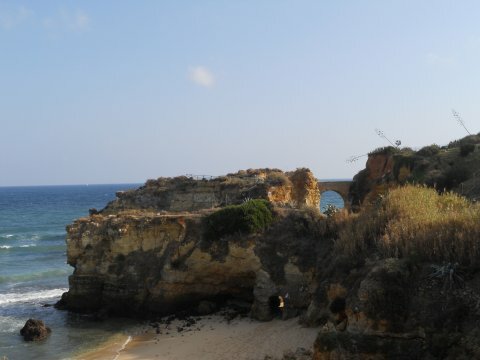 As the wind close to the Cape reportedly always freshens significantly, this meant we still had a good breeze to round this iconic point in our voyage, incidentally the south-western most point of Europe. 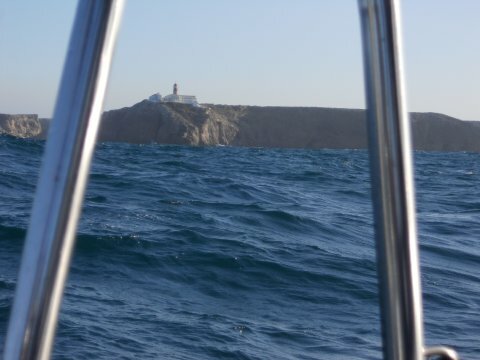 The seas flattened as we rounded Cape St Vincent and even more so as we rounded Pont de Sagres such that we had a perfect sail along the first part of the Algarve coast with the sun sparkling off flat blue seas as we beam reached towards Lagos. 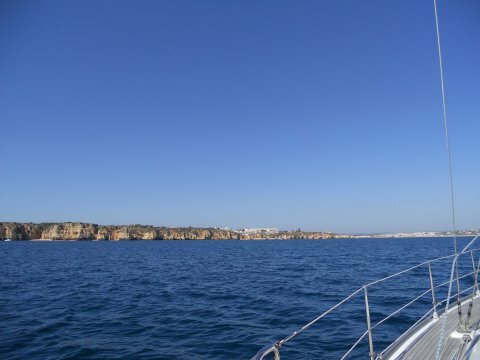 The wind dropped off completely and we motored the last few miles to Lagos, securing to the reception pontoon just under 25 hours after leaving Cascais. 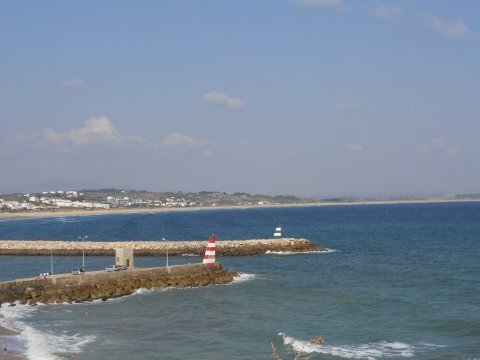 The Algarve - flat seas at last! After being given a choice of berths, we moved to our preferred one, next to a yacht from Fowey! 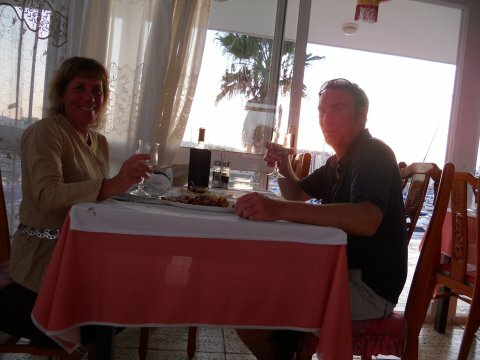 We were quite tired, so had showers and fell into the nearest restaurant, happily a very good Chinese one just at the end of the pontoon - we like Lagos already! We've only been here a couple of days, but already we are pleased with our choice. 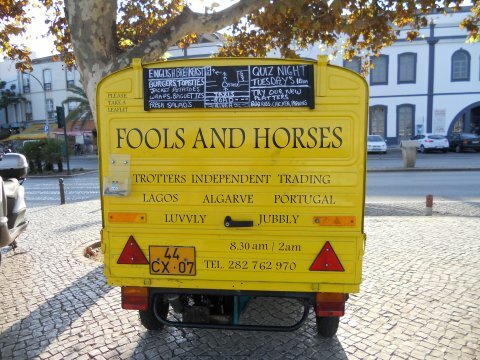 We know we would have been happy in Lisbon, and there were plenty of things to see and do there, but our exploring here so far has not disappointed - the old town is interesting, with a fantastic fish market and a fruit & veg market, both probably the best we've seen anywhere. 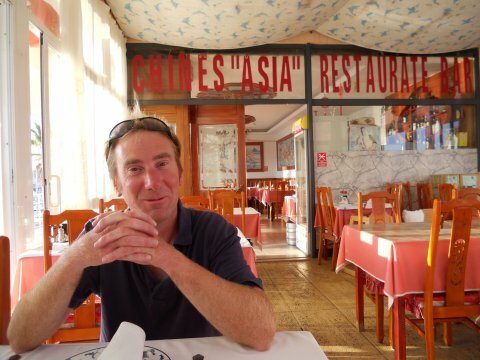 There's also the aforementioned Chinese restaurant, numerous Indian ones as well as Portuguese ones of course, good supermarkets, beaches, coastal walking, other liveaboards and we've joined Lagos Navigators and attended our first social event. There is talk of a whisky tasting evening on my day (St Andrew's Day), so I may be obliged to attend that... We are looking forward to more exploring, hopefully in warmer and drier weather than Lisbon enjoys. 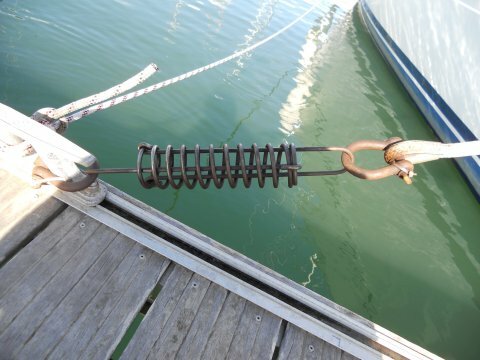 It will be very different from the leafy shores of the Vilaine where we spent last winter, and although there are a number of liveaboards here we will certainly miss Tim & Karen's company. The entrance to our winter billet. Some funny stuff fell out of the sky last night, rain I think it's called, not something we've seen for over two months. Normal service should be resumed a little later in the week, so if any friends and family fancy some winter sun, come on down - EasyJet fly from Bristol & London, and there is accommodation of all sorts aplenty here, though sadly no room on Pipit - the aft cabin is now a store room / larder / office / workshop, the bunk cushions are in Plymouth and the door is in Swindon!